Want to send a special holiday greeting this year? We have three great ideas and five stunning photos that you can copy and remix to create your own! Stand out from the stream and forget the formalities. Use music, sounds, narration and poetry to create your own 360 story about meeting the Santa Claus. In this first example you are walking in a snowy forest until you meet with Edgar Allan Poe and the Raven. 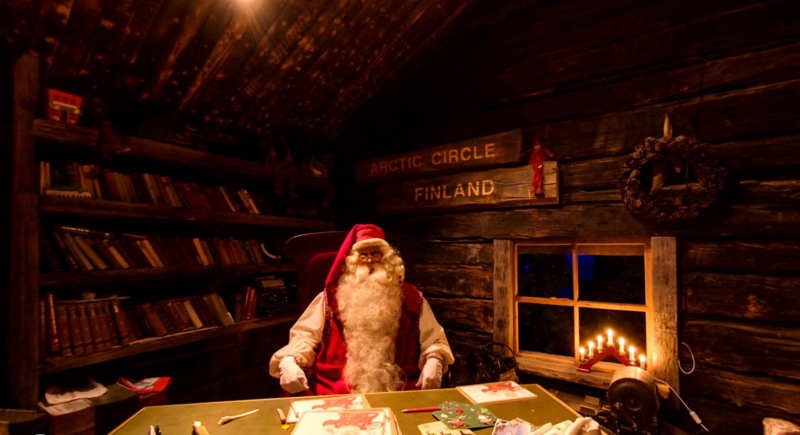 You knock on the door of the green cottage, and step in to the Santa's workshop in Korvatunturi, Finland. Look around and click the things you see in room. Make it personal with individual greetings or say something nice to each team member by adding notes or audio files in separate tags. This example below is a greeting from the ThingLink headquarters to the R&D team. Santa has left little gifts in the office that he thought could be useful at this time of the year. This time of year can be hectic. The easiest way to create a 360 degree holiday greeting is to add your favorite xmas tune in the background of an image,and let your friends and family enjoy a joyful or peaceful moment in a beautiful winter forest with you. Add notes, photos, or audio greetings to make the experience more personal. To use these images in your own greetings, just open the image from the link, make sure you are logged in ThingLink, and click the remix icon beneath each image to create your own version. Note: you need a Teacher or Business Premium account to access the 360 photo editor. To upgrade with 20% off, use the promo code: HAPPY2017.